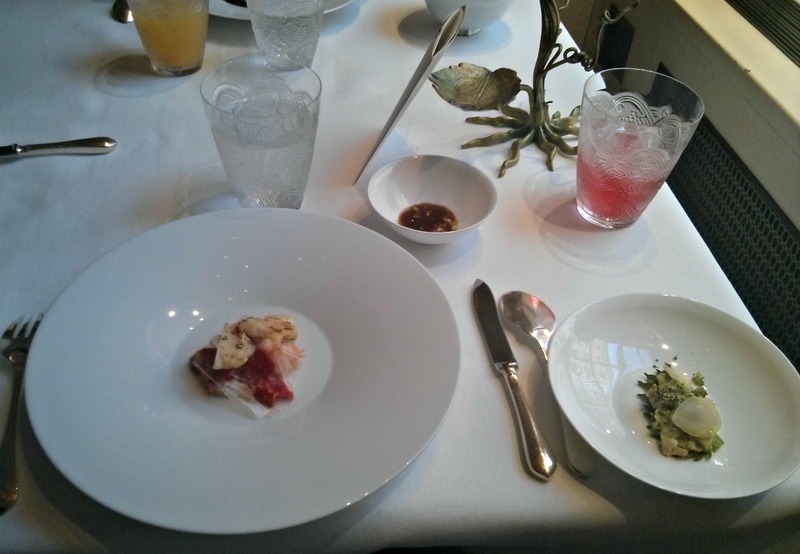 My wife and I enjoyed the tasting menus at Pierre Gagnaires London outpost, Sketch. The venue is a large building just off Regent Street, with tea room, bistro, bars and the 2 starred restaurant, The Lecture Room and Library. The building features some serious decor and design throughout and some stunning areas including a toilet with egg shaped pods like none other I've seen. Upon arriving were lead up a roped off stairway, and double doors were theatrically opened to show the restaurant in all its glory, the best looking dining space I've been in so far. The meal itself was fabulous, with each course featuring multiple elements, sometimes presented on multiple dishes. My first course of a warm dish of lobster, broccoli and sauternes gel, a small bowl of cold lobster jelly, and Asian salad of claw was a good example of this. 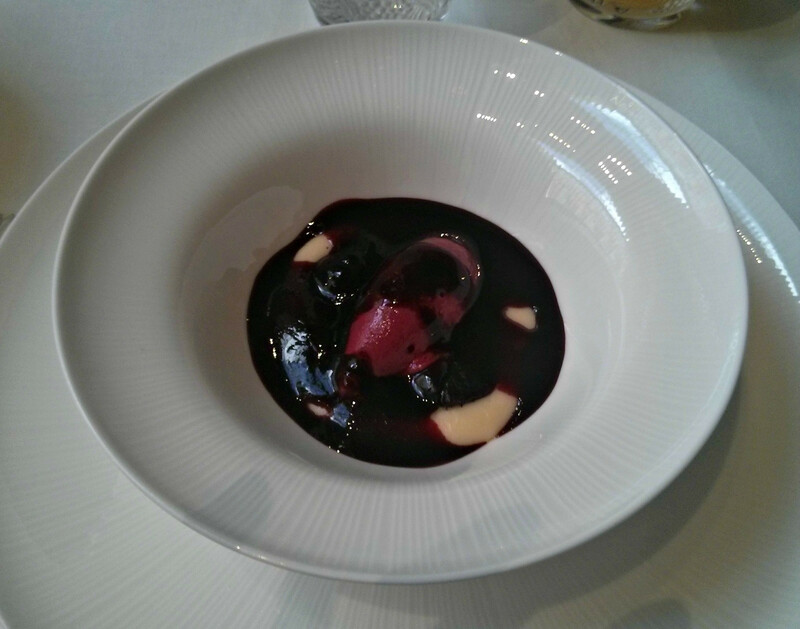 Every course was of the highest quality, as good as anywhere else I've eaten since starting the blog. Stand out dish was probably one of my wives vegetarian courses, a smoked potato, beetroot veloute and blackcurrant ice cream, an unlikely combination that worked incredibly well, smoky, earthy and sweet yet balanced and in harmony, truly outstanding. I also loved Pierre Gagnaires Grand Dessert, 6 different dishes my favourite of which was a lemon veloute, thai herbs, fruits and sorbet, with one of the herbs being coriander, the first time I've had it in a dessert yet worked perfectly with the citrus flavours. All six dishes were an absolute treat. Although I've not written in as much detail as I have with other meals due to time constraints, I can't praise Sketch enough, the venue, food and service were of extremely high standard, and The Lecture Room and Library at Sketch is easily one of the best restaurants in London. Upstairs At The Ten Bells. We had an excellent Sunday lunch at Upstairs At The Ten Bells, the Spitalfields restaurant from the Clove Club guys. As it was December only a set menu was offered, but this was a selection of starters including the excellent buttermilk fried chicken dish on pine I had at the Clove Club, although this time it was pheasant. My wife and I both a had a chestnut veloute starter of excellent quality, and I had an absolutely brilliant main course, a featherblade of beef generously covered in a bone marrow butter, swede puree and cavelo nero. The bone marrow butter was awesome, a slight cheesy note from what might of been unpasteurised butter with the richness of bone marrow, a perfect accompaniment for a blade of beef so soft I used a fork to cut. I like this venue, the pub being steeped in history, indeed the rickety stairs up to the restaurant featured bare plaster, gas lamps and an old sash window that looked as it probably did when Jack The Rippers victims plied their trade there. Our third visit to Kitchen Table showed the same commitment to consistency, high quality food and service we've had in all our meals there. An excellent evening as always, with some stand out dishes including a pigeon, a beef and burnt cream combination, which sounded unusual but worked incredibly well, a corned beef sandwich amuse bouche that still has my mouth watering to think about it, a beefsteak mushroom dish, a butternut squash pasta dish laden with truffle, and a fantastic brie, white Alba truffle, honey and brioche cheese course that would be hard to top anywhere. 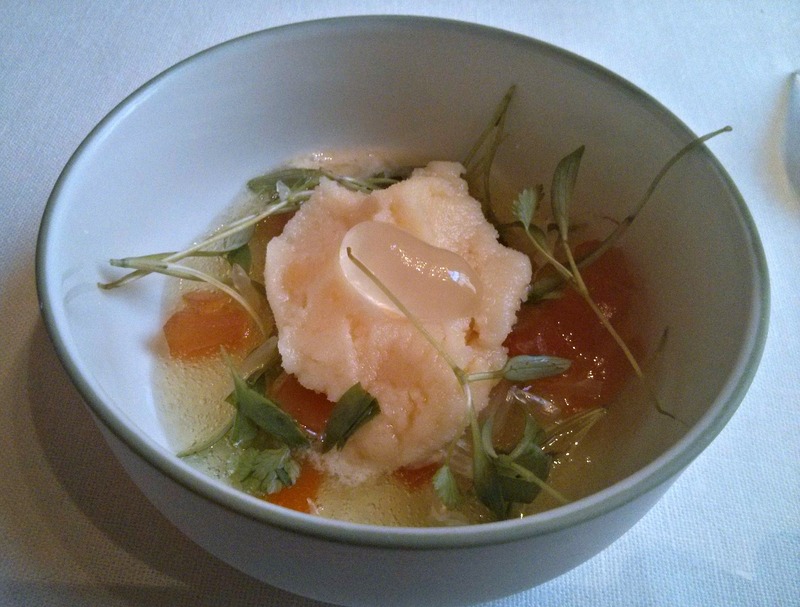 Lemon veloute, thai herbs, fruit and sorbet at Sketch. 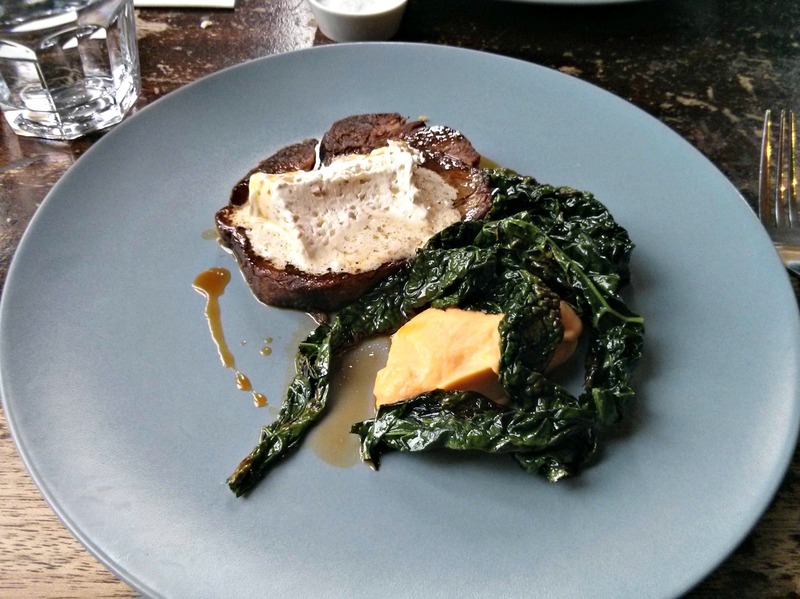 Featherblade of beef, bone marrow butter, swede puree, cavolo nero at Upstairs At The Ten Bells. 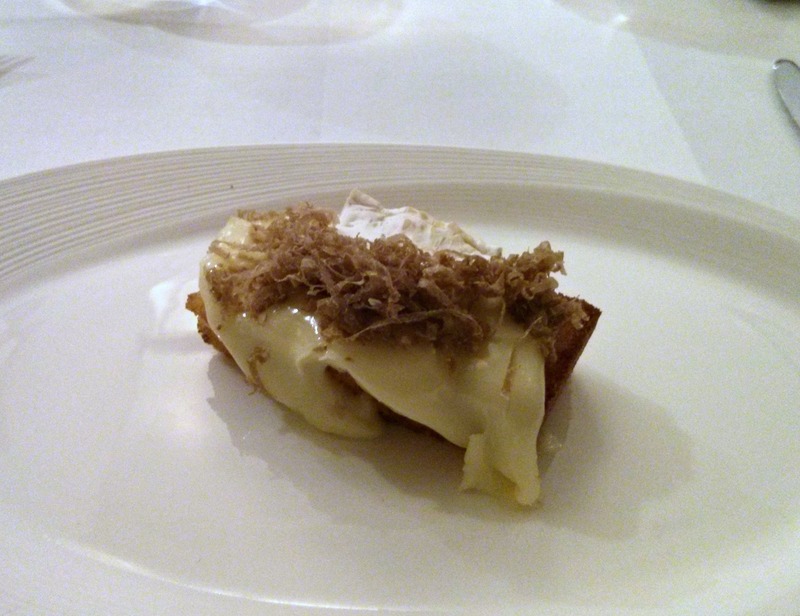 Brie, white Alba truffle, honey and brioche at Kitchen Table.